An enchanting cookbook of appetizers, canapes and finger foods. 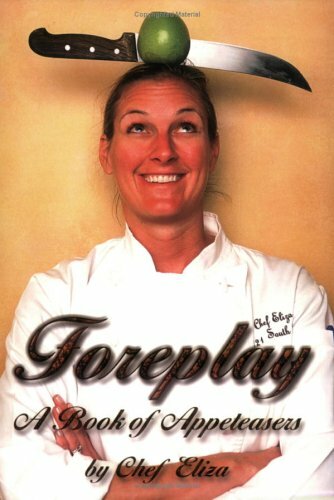 With thorough recipes and fun anecdotes, Foreplay is a must in any kitchen. Product Details Paperback: 186 pages Publisher: Goodall LLC (December 22, 2005) ISBN-10: 0977651304 ISBN-13: 978-0977651306 Product Dimensions: 9.9 x 6.9 x 0.5 inches Shipping Weight: 14.4 ounces Average Customer Review: Be the first to review this item Amazon Best Sellers Rank: #2,824,694 in Books (See Top 100 in Books) Did we miss any relevant features for this product? Tell us what we missed. Would you like to update product info, give feedback on images, or tell us about a lower price? Editorial Reviews About the Author Eliza's cuisine is classified as Modern Bistro Cuisine but it is an eclectic blend of flavors and styles. She has traveled extensively through Europe, the Caribbean, New Zealand, Australia, South America and the United States. Eliza has enjoyed the great seafood of Seattle, Boston, Nantucket and the Chesapeake Bay. She has devoured the Southern Cuisine of Virginia, South Carolina and Tennessee. On her 21st birthday she ate a camel burger for lunch, EMU pâté for tea and kangaroo steak for dinner. She has cooked with great chefs and learned from one hundred-year-old recipes. All of these influences comprise Eliza's Cuisine. It is melange of seafood, game and poultry with accompaniments that range from Deep South to Calypso to Classical French to Californian Cuisine to Creole. It could be New American or Modern Bistro but at 221 we call it Eliza's cooking. If you have any questions about this product by Brand: Goodall LLC, contact us by completing and submitting the form below. If you are looking for a specif part number, please include it with your message.